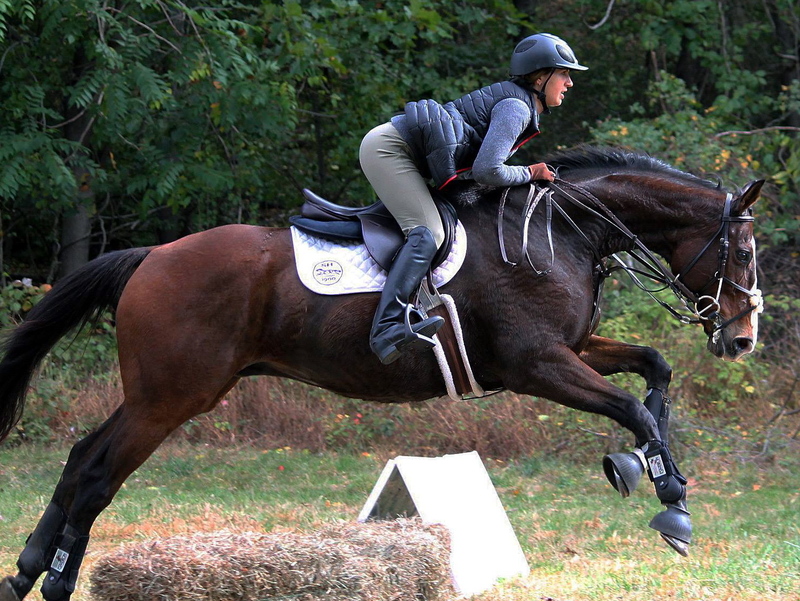 The photographer put up the photos of Billy and me from the last hunter pace. Since it’s not Mabou, I didn’t purchase any, but here are the links to view them on their site! Off to ride, hopefully I can ride outside today if the ring has thawed a little! Sunday the sun was shining and after the beginning of the day debacle, the day was wonderful! This one is one of my very favorite paces. 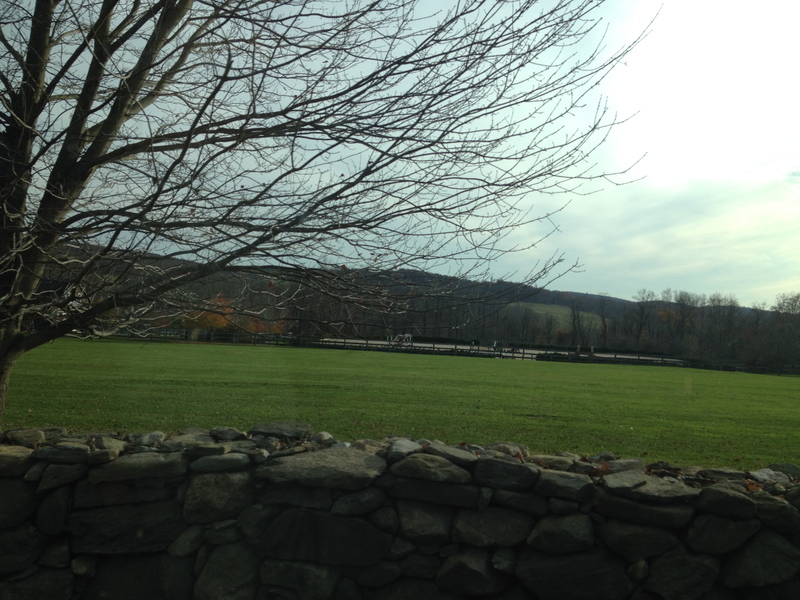 There are so many fields and soooo soooo many jumps, all of which are stone walls, large logs, or coops. Billy was very excited when we got there, but then he quickly settled. He jumped everything I pointed him at and was very sensible through all the different footing we encountered. 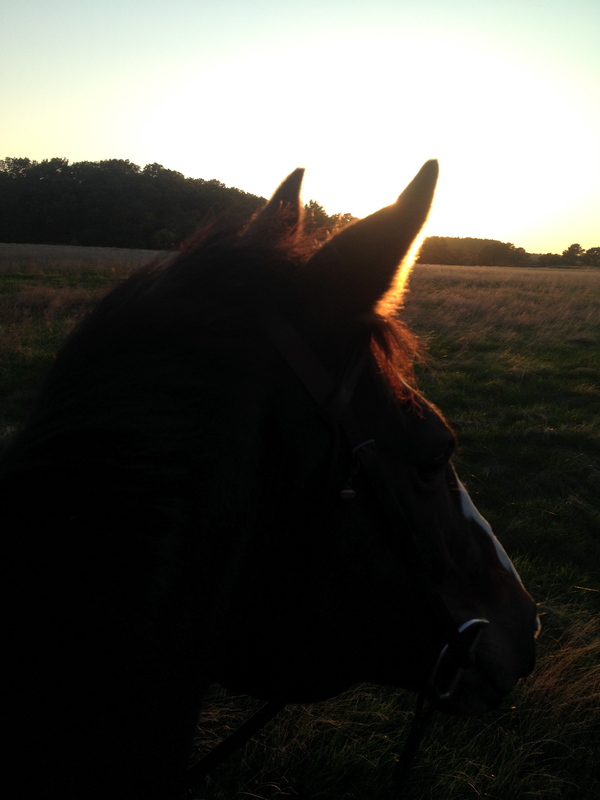 I got tired galloping him in the fields, I now realize how spoiled I am by how easily Mabou eats up the fields with his effortless TB gallop. We thought that there was a pace photographer, since there was a photographer stationed after one of the big stone walls, but after emailing the pace organizers today, I have found out that it was a private person, and not someone that we could purchase the photos from. Bummer, so we have zero riding photos. So Saturday morning I headed over to the barn nice and early to (a) confirm my horse’s shoe was back on and (b) get everything ready for the pace. Fortunately, Mabou’s shoe was on, but, I discovered that his left from leg was hot and puffy in the top of the tendon behind the cannon bone, right below his knee. I immediately had my trainer look at it, although he was sound she agreed with me that he shouldn’t go to the pace. Which left me horseless for sunday’s pace. 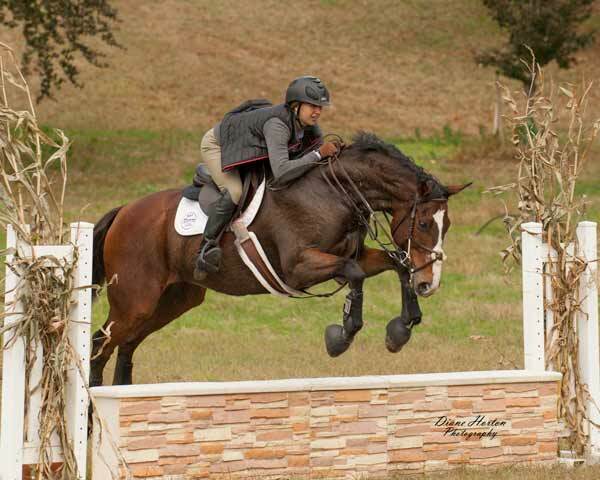 Trainer so nicely offered to let me take one of her horses, Billy, a jumper who competes in the 3’6″. 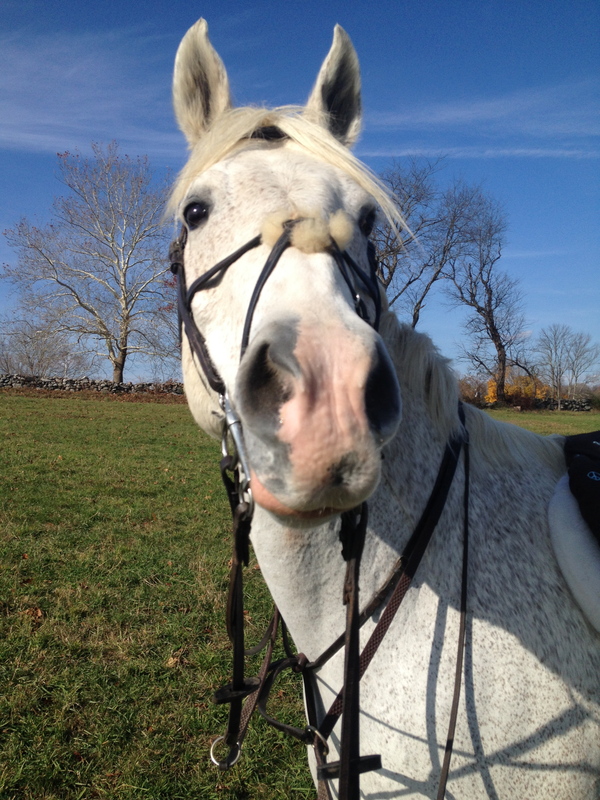 I was happy to have a horse to take, but a little nervous to ride him for the first time galloping in huge open fields and jumping stone walls. But, I didn’t want to miss out on the last pace of the year so I thankfully accepted her offer. Sunday morning we all arrived at the barn bright and early, gave a quick groom, and loaded 7 horses into the big rig and 2 into the 2 horse trailer (yes 9 of us went, we go big!). I jumped into the truck towing the two horse that my friend D was driving, along with our other friend C, and away we went to North Salem, NY. We had gotten a blowout, a super bad blowout. We quickly called the people who were in the other truck, which pulled over up ahead of us. 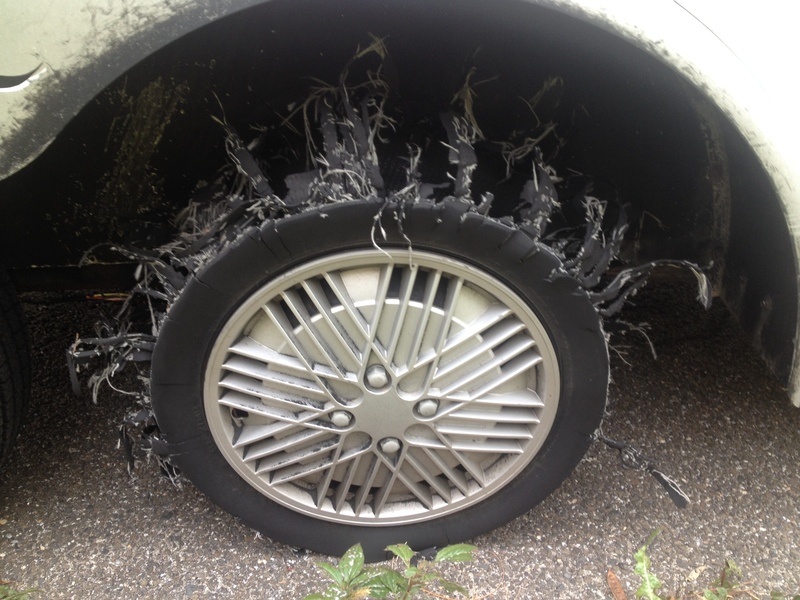 We inched our way along the shoulder to pull up right behind them, so all 9 of us could help out to change the tire. 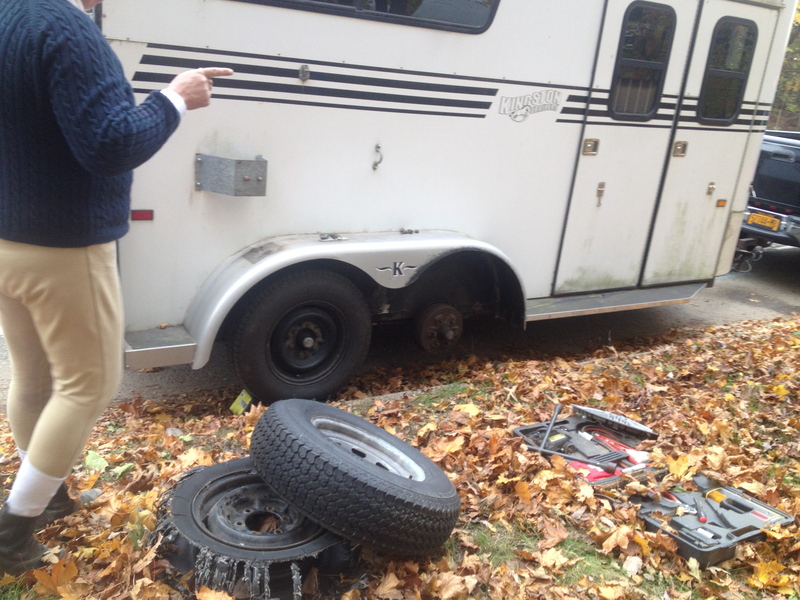 We successfully got the trailer’s good wheel up on the trailer jack and set to work removing the blown out tire. 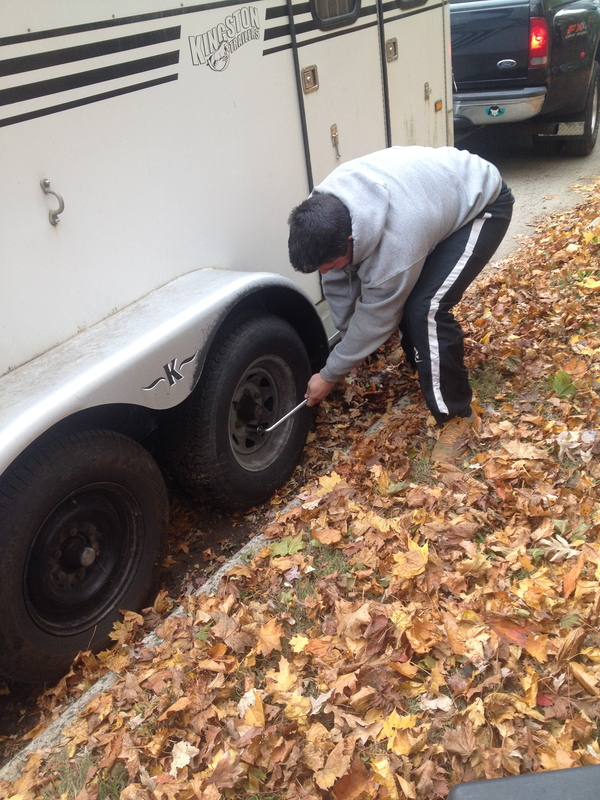 The kind man, who we will just refer to as hero, realized that we jacked the trailer too close to the curb and it was impossible to put the spare tire on with the curb blocking. So down went the trailer from the jack, the truck and trailer was moved, and put back on the jack. 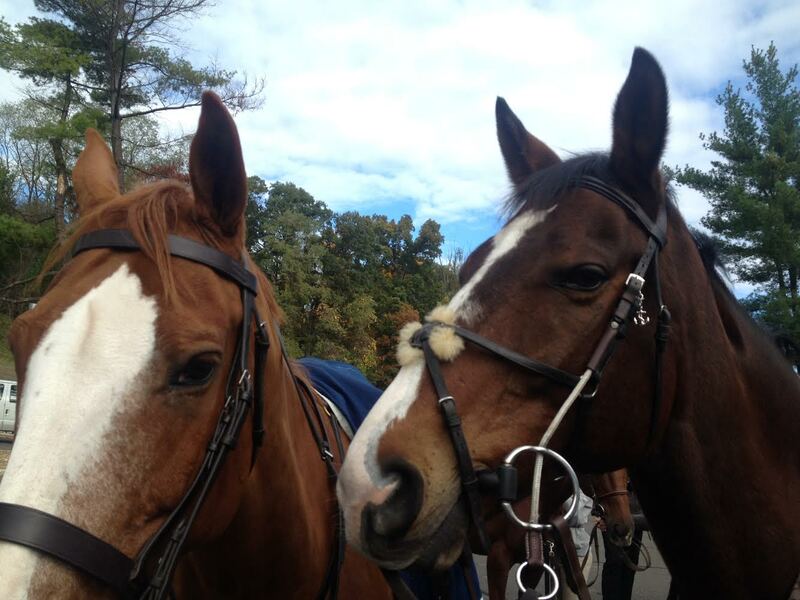 Good thing the horses were such good sports about this situation. 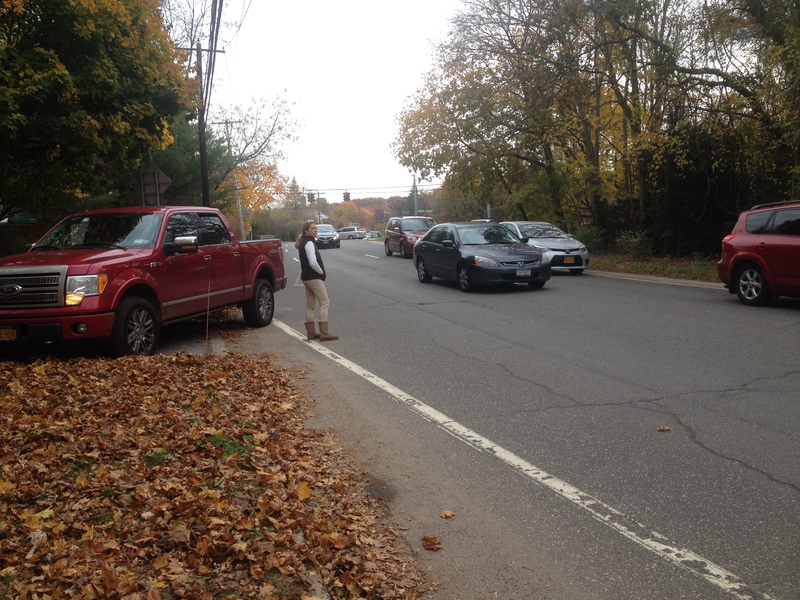 The hero quickly got the tire on and squared away, with all 9 women standing around in a circle watching him work. Thanks to him, we were back on the road without too much delay! Will have to put the rest of this adventure, when we arrived at the pace, into a separate post! 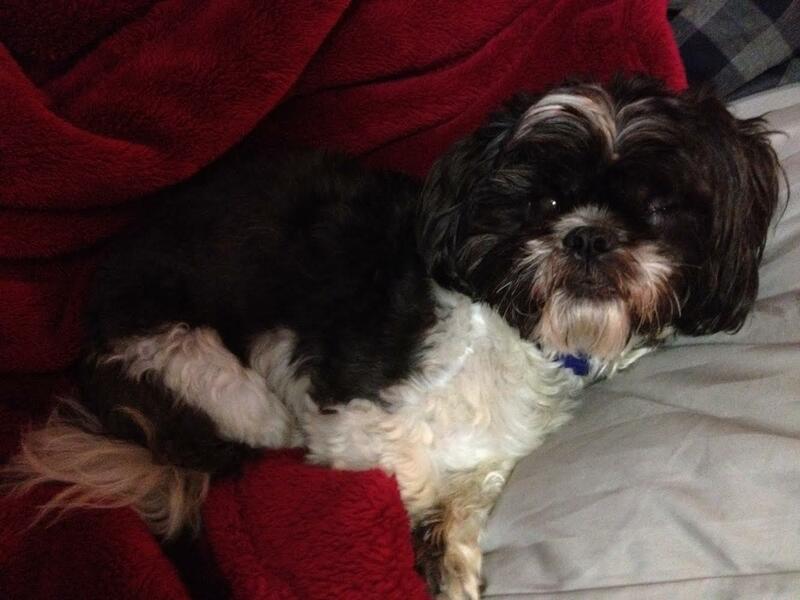 PS- Vet comes today to ultrasound Mabou’s leg (better safe than sorry), so we shall see how that turns out! I got the photo I ordered from the Sleepy Hollow pace- ta da! I was wearing the JOTT (Just Over the Top) Vest for that pace that has seriously been part of my everyday fall wardrobe. I can’t say enough good things about it! Very thin and lightweight but SUPER warm! This past week was very busy for me- work was crazy, hubby was on vacation so we spent a lot of time shopping for a new car for me (yay! ), new kitchen cabinets, and new kitchen appliances. I was also trying to fit in after-work outdoor arena rides before daylight savings strikes this weekend and the clocks get turned back and relegate me to indoor arena only rides. Although I love the fall, this time of year is kinda depressing for me, after a summer of a lot of riding and progress the fall is more of a wind-down into winter where I don’t do much riding once it hits around 30 degrees. Mabou has been great recently, we have not been working on anything new, just really keeping him in shape for hunting at this point. To cope with all of the dreadfulness that is the colder weather, I have been doing some retail therapy (of course). I ordered two more bridle charms, one is the evil eye (to protect us from evil) and one is a silver “M”. I also got two of the Essex Talent Yarn show shirts, which I haven’t tried on yet or obviously worn since I am not showing right now. A review of those will have to wait until the spring. 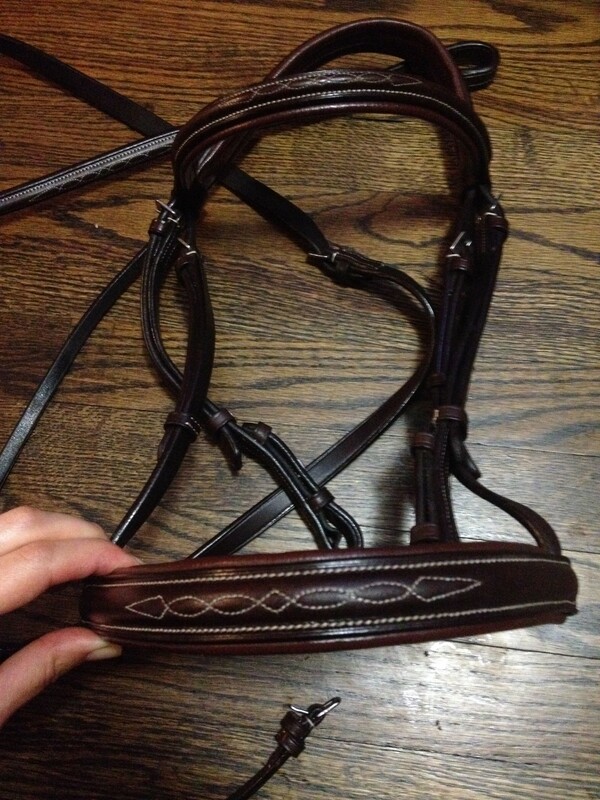 My favorite purchase that I made was a new show bridle! 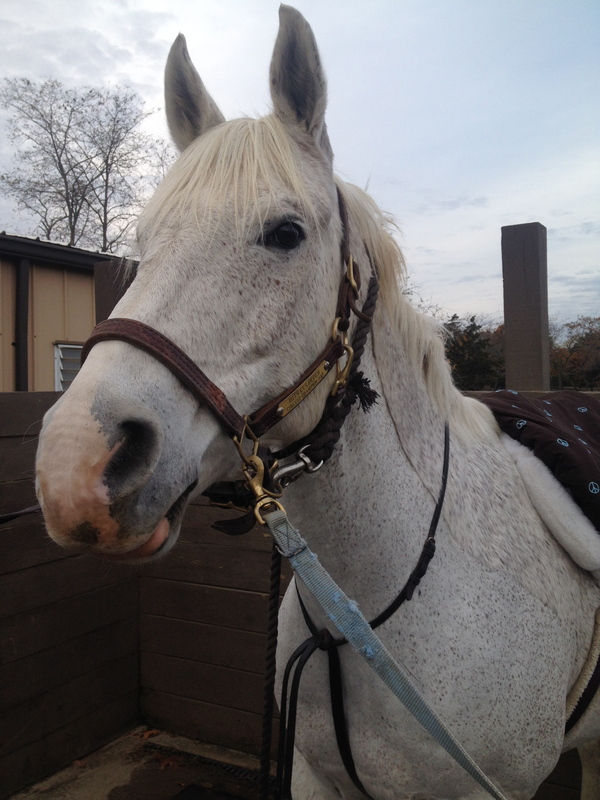 I got a Bobby’s bridle with a fancy stitched wide padded noseband. 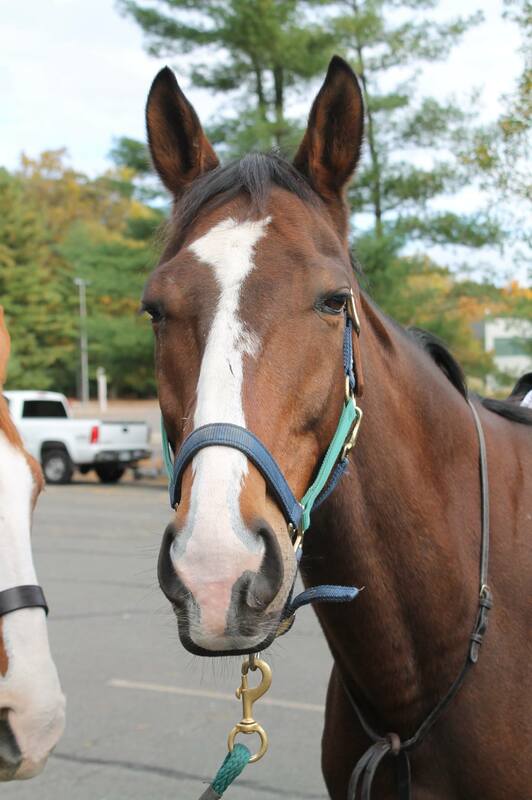 I love the look of the wide nosebands. 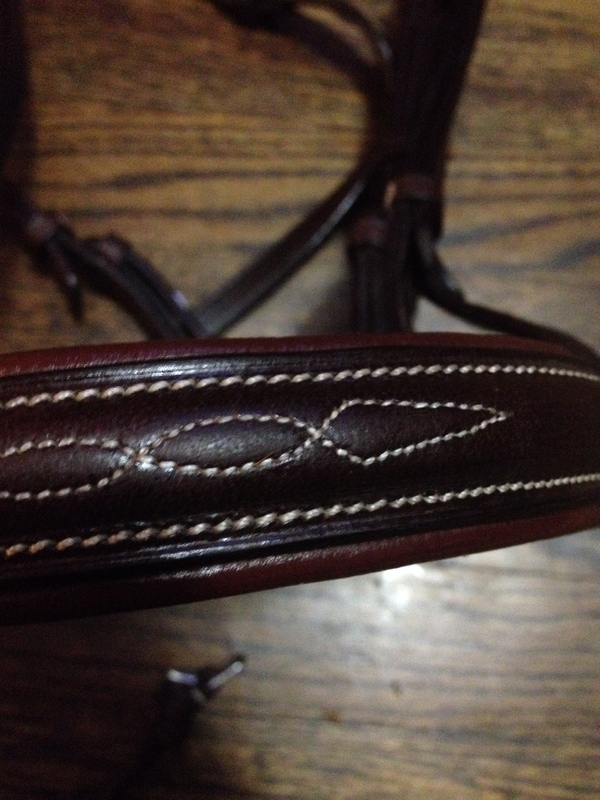 Right from the get-go, this bridle was buttery soft. It barely even needed the oiling I gave it. The padding is very soft and the stitching is impeccable. 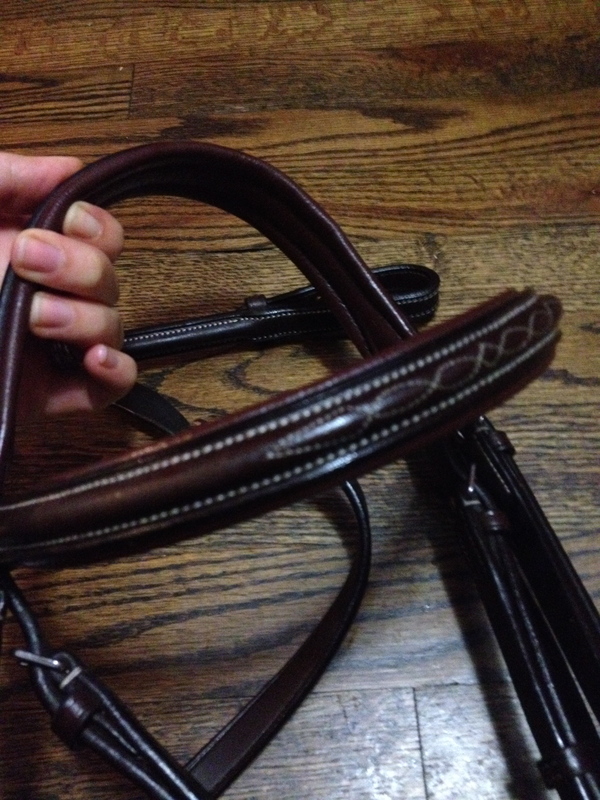 I am really impressed, as it is nicer quality leather than some high end bridles I have seen. I cannot wait to see how nice it looks on Mabou! It also has the monocrown design for comfort, with a wide softly padded crown and padding around almost the entire noseband. 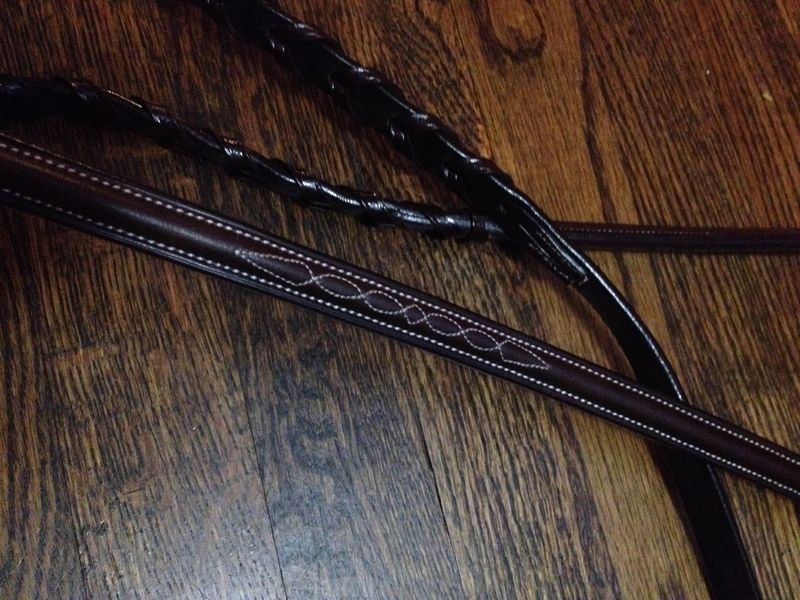 The matching reins are also super soft and flexible, and likewise felt great in my hands even before I gave them a coat of oil. 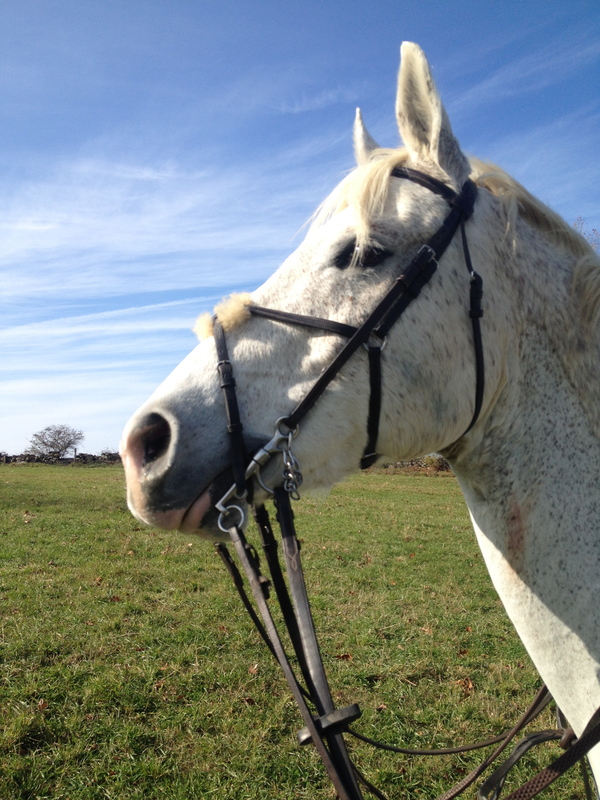 If you for a nice quality bridle at a good price point, I highly recommend the Bobby’s! I can’t speak to the durability at this point yet, but my trainer has a flat Bobby’s hunt bridle that still looks great after years of being abused in the hunt field, so that is saying something! Should have saved all these babies for Wordless Wednesday tomorrow but hey I couldn’t resist- Ta Da here they are! The scenery was absolutely beautiful! It was pretty chilly and breezy, but thank goodness no rain in sight. 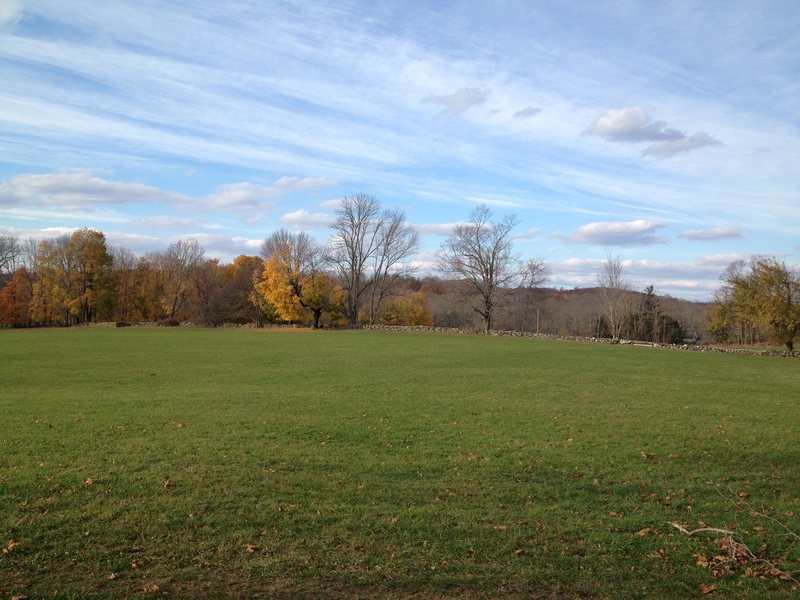 You could see the water (I think the Hudson river but I may be WAY off). 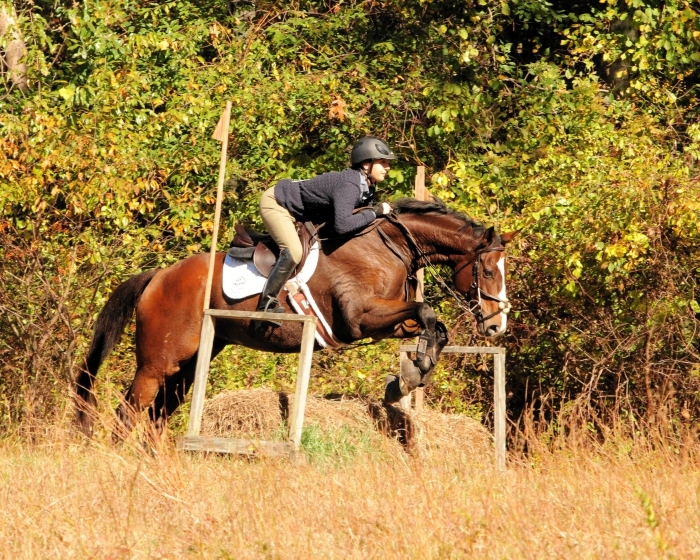 There were a few jumps, not as many as last weekend, but we got a few nice log and hay bale jumps in. 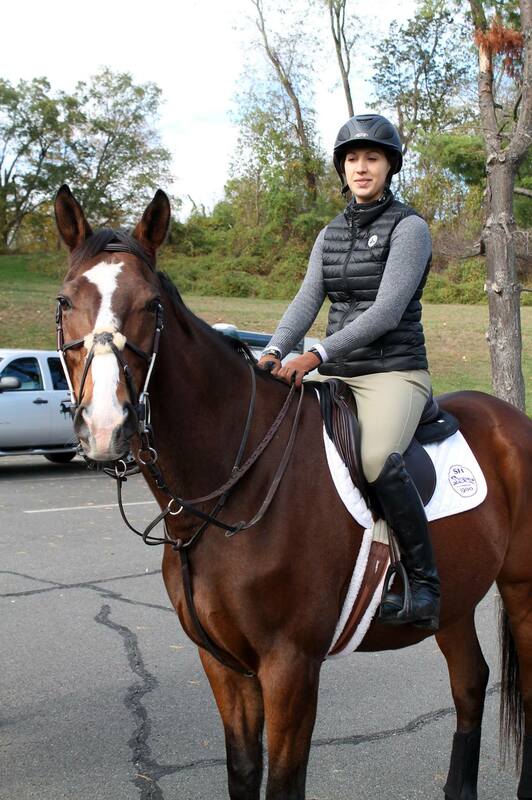 When we first got there I was freezing and was going to wear a show shirt, sweater, down vest and down jacket, but thank goodness trainer convinced me to take the down jacket off as after about 15 minutes of riding I was sweating. Now for the ribbons…. 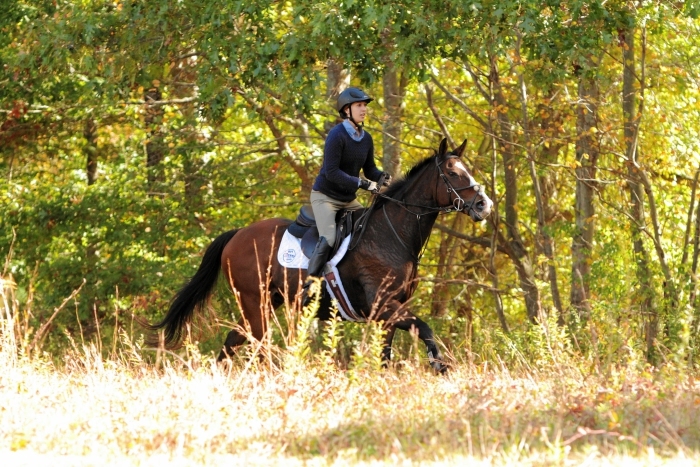 for those of you who may not have participated in a hunter pace, the objective is to ride the closest to the “optimal time”. 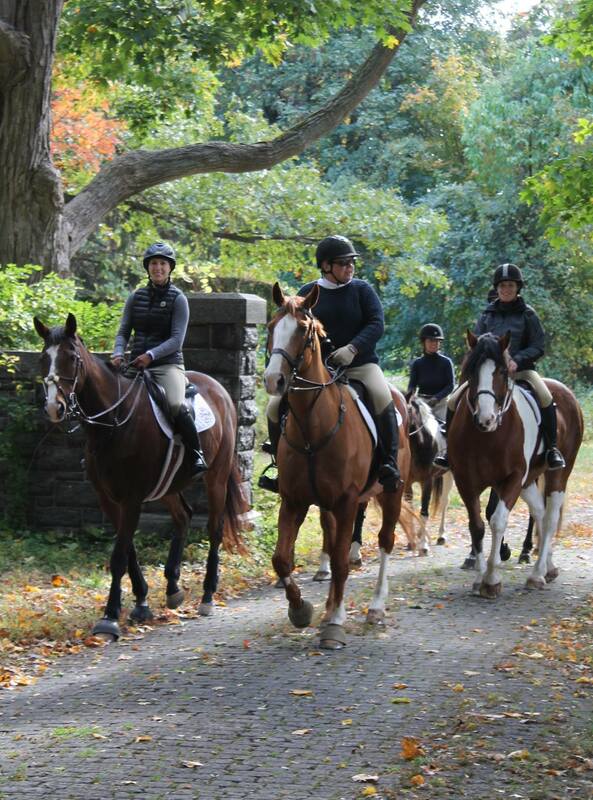 Optimal time is set by someone selected by the organizers of the hunter pace who rides the course at the pace for your division ahead of time (either the day before or the morning of usually), for example, pleasure pace is a slower, leisurely pace, while hunt pace is supposed to simulate a fox hunt, with mostly cantering and trotting where necessary due to footing. 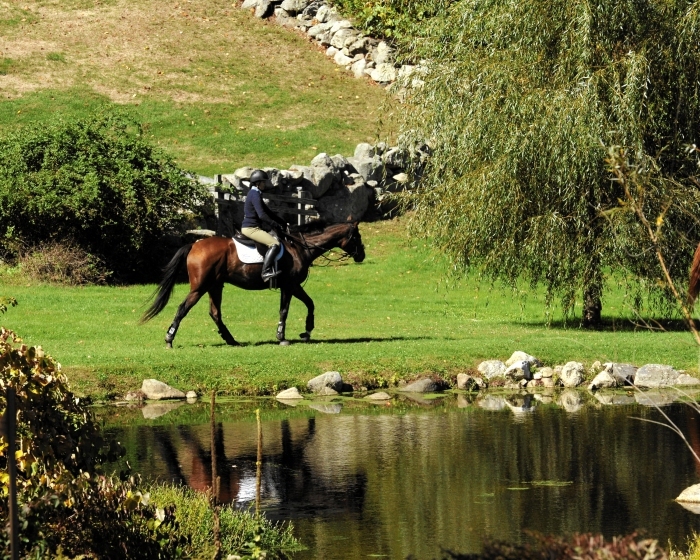 Whatever time that person clocks in at riding the hunter pace course, that becomes the optimal time for each division, setting the standard by which the ribbons are decided. Our pace was 1 hour 1 minute. 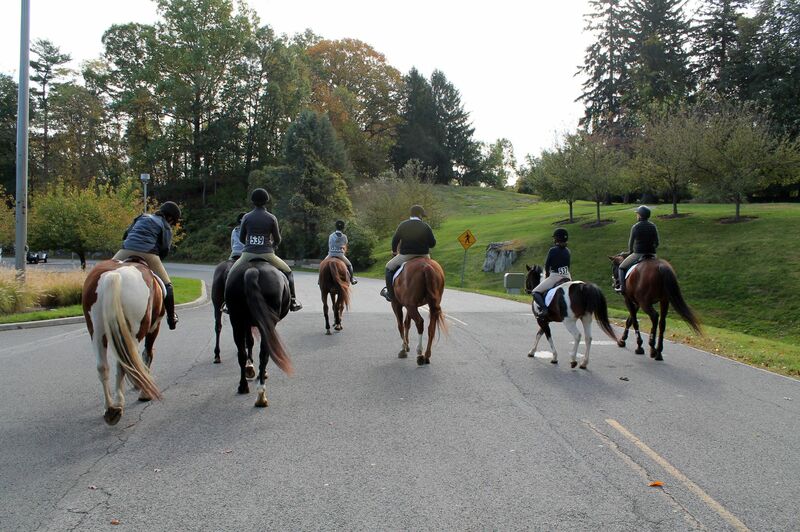 I guess we had a little too much fun galloping the wide carriage roads because the optimal pace turned out to be 1 hour 23 minutes, effectively shutting us out of the ribbons. 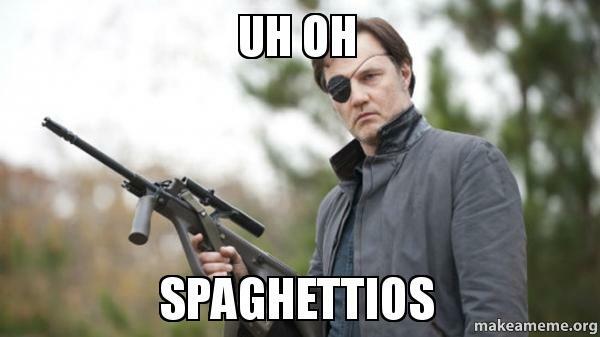 Whoops…. 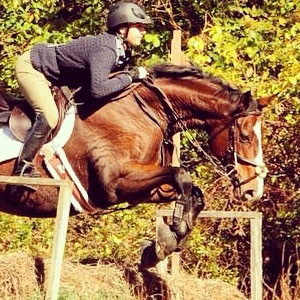 I have an OTTB with a big stride what is a girl to do?! 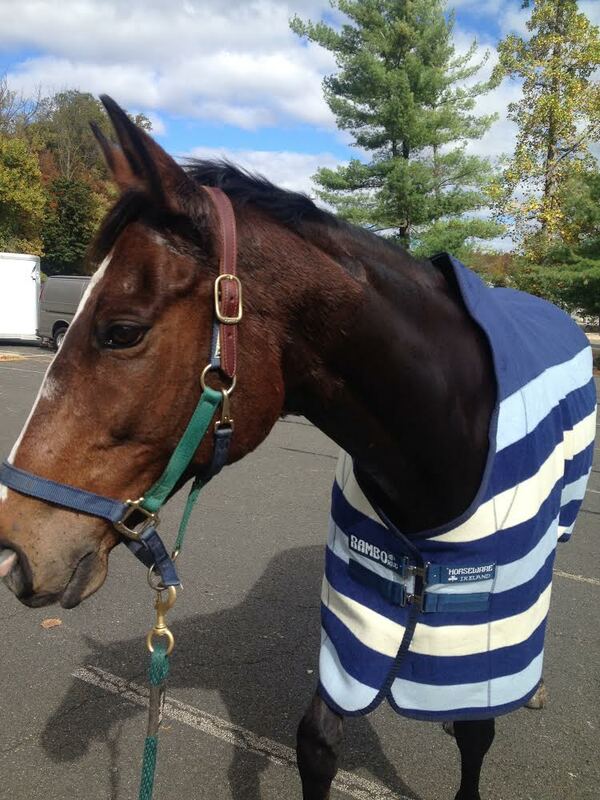 Mabou wore his new Rambo Newmarket cooler…. fit great and it is really nice quality! (Sure got lucky here as I brought the threw the brand new cooler in the trailer to bring without even trying it on him first) I was pleasantly surprised that the neck was cut a little higher, which fit great on his narrow shoulders. I don’t have any action shots at the moment to post, but my trainer’s sister was nice enough to come to the pace and take photos for us! So I will post those when I get them, hopefully later this week. For now I will just post the “hanging out waiting to ride” pics! We got home around 6:30 p.m., making for a very long day, but it was worth it! 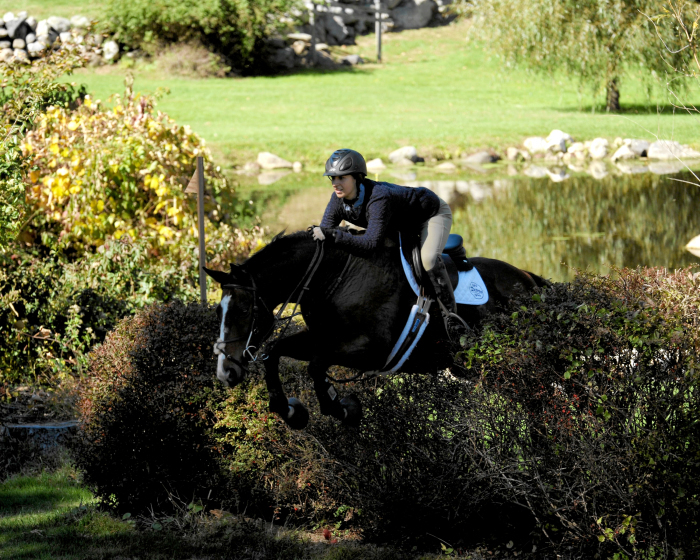 Here are the photos from the Greenwich, CT hunter pace last weekend. I love how they came out! 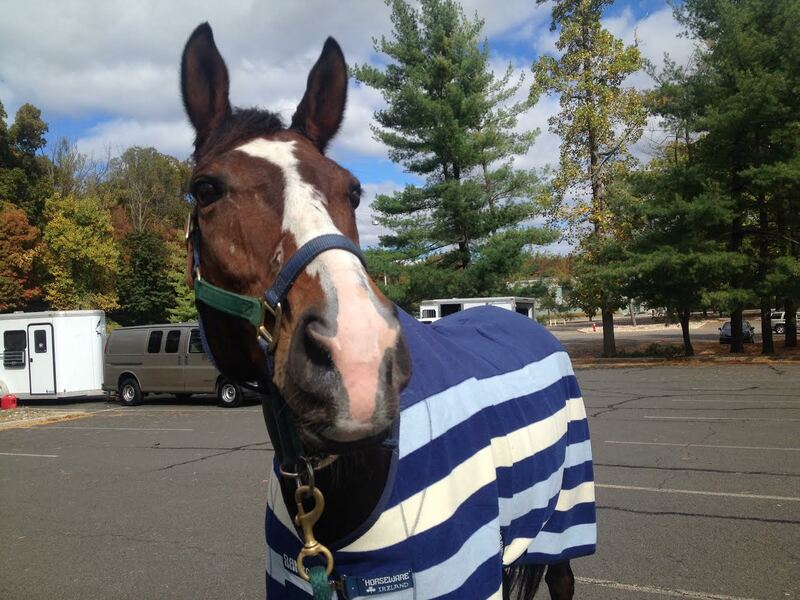 Enabling tack junkies & horse enthusiasts with great prices on tack & apparel. All the gear and no idea? 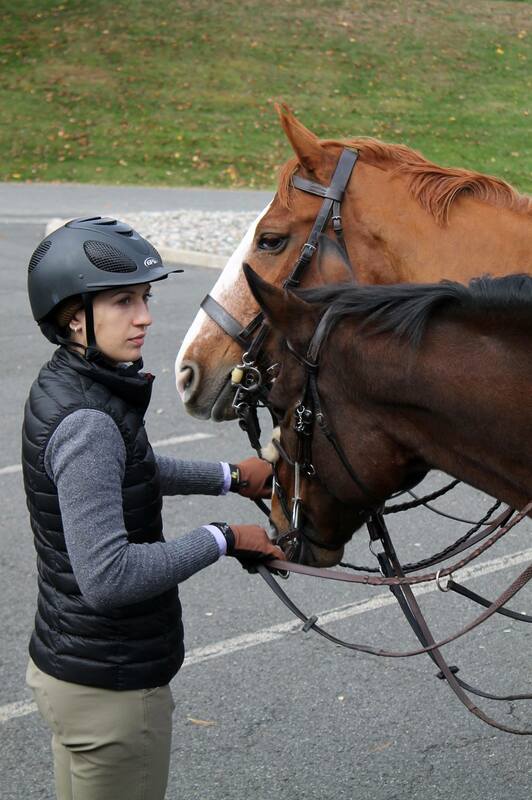 Brutally honest experiences of a high school horseback rider.